Welcome to Colin Comer Books – the only bookstore to exclusively feature the award-winning books by author Colin Comer. If you’re looking for books on cooking, gardening, or how to train your dog not to bite the postal carrier, you’ll have to go elsewhere because you won’t find them here. Which, if you are a car lover, isn’t all bad- we’ve made it easy to find the car books you really want, and we won’t try to make you bundle them with ten pounds of gummy bears, or tell you if you sign up for a credit card we’ll ship faster. Not that there is anything wrong with gummy bears. 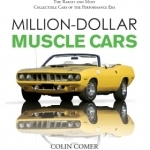 Comer’s authorial debut, Million Dollar Muscle Cars in which Comer individually profiles the rarest and most desirable muscle cars in existence, and tracks their values from new to now. There are also features on up and coming muscle, plus best bets in muscle almost anyone can afford- and tips on how to not get ripped off when you go to buy them. Million Dollar Muscle Cars shows you the cars, the players, and gives you the back story on just where this meteoric rise in values started and why. Add in spectacular photography by David Newhardt and you have a book worthy of prime placement on any gearhead’s bookshelf. Get your copy today and see what has made this definitive work one of the highest selling and most critically acclaimed muscle car books ever published. 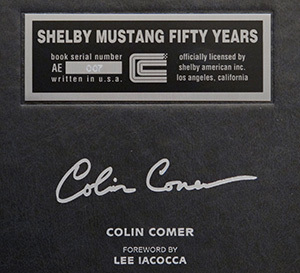 The Complete Book of Shelby Automobiles: Cobras, Mustangs and Super Snakes is Comer’s second published work, and his true passion for the cars of Shelby American shines through. This highly informative and lavishly illustrated work transports readers through Shelby American’s forty-plus years in an exhaustive review from the first Cobra produced in 1962 through today’s fire-breathing, world-beating Shelby GT500KR Mustang. Hundreds of never before seen archival and stunning contemporary photographs will make this a book you will study for hours on end. Even the most die hard Shelby fan will learn something new about their favorite Texan and his endeavors. 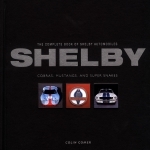 All of which explains why The Complete Book of Shelby Automobiles remains the best selling Shelby book ever printed. 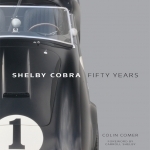 The highly acclaimed Shelby Cobra Fifty Years is Comer’s third book and proves what we all knew: it was worth the wait! Shelby Cobra Fifty Years is not only a complete history and celebration of Shelby’s Cobra, but also about the people that made it great and have kept the legend alive. From Carroll Shelby’s start in sports car racing, to his dream of building a world-class sports car, to the impact the Cobra had on the motoring world that is stronger than ever today, this book has it all. Consider it a stack of yearbooks from your favorite All-American’s career. This is a Cobra book like no other, a fresh approach from a writer who knows the cars like no other. As always, Comer delivers unbelievable and formerly unseen archival photos, combined with stunning contemporary shots that are worth the price of admission alone. As Carroll Shelby says in his foreword, “they got the right guy to write this book when they picked Colin.” We couldn’t have said it better ourselves! Shelby Mustang Fifty Years is just that- a celebration of fifty years of these magnificent machines and covers every iteration from the original, raw 1965 GT350s to today’s Shelby 1000 monster. More importantly it profiles the men that made it all happen like “Mr. GT350” Chuck Cantwell, Peter Brock, and the men that keep the dream alive today like Jim Farley of Ford Motor Co. Created in cooperation with the Carroll Hall Shelby Trust and officially licensed by Carroll Shelby Licensing, Inc., Shelby Mustang Fifty Years is lavishly illustrated with rare, historic photography and modern color images to chronicle the story of these amazing cars, from the initial collaboration with Ford to today’s record-setting high-tech muscle. Foreword and tribute to Carroll Shelby by the “Father of the Mustang” Lee Iacocca. 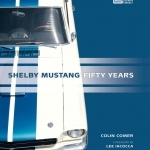 Just like all of Colin Comer’s other books, Shelby Mustang Fifty Years is a not-to-be-missed masterpiece that will thrill everybody from the most casual Mustang enthusiast to the most dyed-in-the-wool Shelby fan.